Lisa Feinstein, Vice President for Institutional Advancement Co-Chair of the Women in Games Initiative at The Strong National Museum of Play: I’ve always loved games, gaming, and all forms of play. I started out my career as an educator, so I passionately believe that people of all ages learn best through play—and that video games provide an utterly unique platform for people to learn, create, communicate, and grow. The Strong is the only museum in the world dedicated to interpreting and exploring the historical impact of play, particularly the ways in which play simultaneously reflects and shapes cultural trends. Tricia Sugita, Chief Operating Officer at FlyQuest: After my father passed away from cancer, I started playing StarCraft 2 as an outlet. Being able to communicate with people over Battle.net and losing myself in the game helped with the pain. After lots of playing, I ended up getting really, really good—as in, Top Eight Masters (before Grand Masters was released) rank good. It was at my first BlizzCon in 2011 that my interest in esports really started to present itself. Julie Woods, Technical Producer at NCompass International: Growing up I played PC games with my dad. We bonded over Duke Nukem, Return to Castle Wolfenstein, Quake, etc. I hope gaming can continue to bring people and families together as a source of bonding and community. The competitive part is fun but it can also be so much more than just that. Abby, Community and Influencer Relations Manager at Logitech G: I had always been a gamer, but a lot of my focus was on comics, costuming and cosplay. When I began my career in social media marketing, I wanted to work on projects that I was passionate about. That led me to working at Ubisoft, Crystal Dynamics and now Logitech G.
Tiffany Beers, Head of Innovation and Audio Engineering at Logitech G & Astro Gaming: My background is actually in Plastics Engineering and Sneakers… I spent 13 years at Nike integrating electronics into sneakers…ie Nike Mag, Hyperadapt. I wanted to work on more integrated wearables and in Gaming because I love play and competition but mostly because i was fascinated with how gaming can teach and actually improve your real life skills like in simulation. After that, I became a streamer, a host, a caster, an interviewer, and a pro player across different titles—including StarCraft, Dota 2, and League—before moving behind-the-scenes to the business side of the industry. Colleen Cunha, Partnerships Manager at Inven Global: I have a background in production and the company I was working at slowly morphed into a media company specializing in live streams and esports content. I found myself running a live show about gaming news, writing and producing esports competitions, and spending far too much time playing games myself. Five years later, I’ve moved on to a new position where I get to help bring together gaming personalities, developers, and fans to branded content they love and exciting live industry events. Julie: I came to gaming and esports through NCompass. Initially I worked in their IT department, and I constantly heard and saw what events they worked on, how they were produced, and the technology they implemented. I began asking if I could help out in small ways. I made sure I listened and absorbed the conversations around the office and literally asked a million questions. People in the office became my mentors without even knowing it. After I traveled and helped out on a few smaller programs I knew I wanted to be working solely on event technology. I honestly never thought I would be involved with areas like encoding and transmission of a live broadcast, managing hundreds of game station set ups or solving technical challenges for upcoming shows in multiple countries. I have found a love of new game titles and developed a strong voice with our company and with our clients on gaming and technology. Donna Graves, Co-Founder and CEO; Kae Erickson, Co-Founder and COO at NCompass International: We started the company over 15 years ago based on this vision to give others the opportunity to build dreams and life journeys. We identified the growing trend and global opportunity that the gaming community would provide, and our inclination was confirmed with initial projects including the PlayStation 3 launch, Best Buy, and Activision. From there it exploded! Mobile gaming, downloadable games, and content updates combined with online global gaming have moved everything into the digital world. As pioneers, we showed clients how to take their digital world and turn it into a live consumer experience which was then shared digitally back to the gaming community. We had to pivot our business model to adjust into unknown territory growing along with the gaming industry. Julie: This role is ever changing and growing as gaming develops and we continue to innovate new things for our clients and programs, evolving with the industry itself. I’m excited to see where we all go together. Lisa: A key part of the history of video games is the often under-told story of women in games—not only as creators, but also as players and characters. 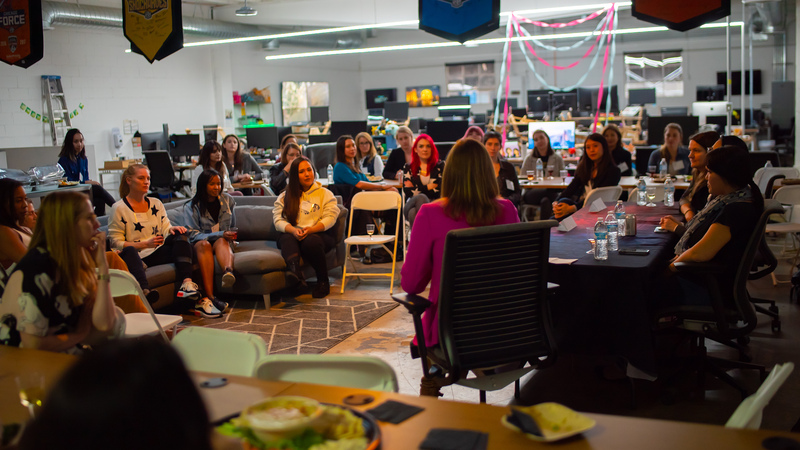 To help tell that story, The Strong launched our Women in Games Initiative with the goal of archiving and sharing the stories of women in games with the ultimate goal of inspiring young girls to confidently pursue careers in tech and gaming, all while encouraging broader inclusivity across the industry. As co-chairs of the Women in Games Initiative at The Strong, Shannon Symonds and I work with women throughout the industry to preserve their stories and archive their work for posterity. We might have the best jobs in the world! Abby: I think gaming is finally really starting to show the changes that so many have been advocating for. I believe that awareness and strong allies in the industry have provided the necessary momentum. Tiffany: I hope to only encourage this by the work I do. I would love to see more coed teams and I know they are coming. I feel confident that gender really doesn’t matter in gaming, everyone and anyone is truly welcome. Colleen: The industry as a whole will benefit from new, diverse perspectives. I hope we see more growth and change, especially on the talent side, but I also know we have to make the industry a safe place for women to want to work. Tiffany: Take your career into your own hands and go after what you want. Reach out to people and network, you never know unless you try. Know that you have the skills and everything needed to do the job. Sure there will be some challenges, ignore the ones that don’t matter and learn from the ones that do. Donna, Kae: We recommend involvement with local and online communities. Many communities and high schools are offering after school clubs and programming that are a great way to get started. Universities around the country are offering curriculum around esports and gaming that crosses over into sales and marketing, technical production, programming, game development, digital graphics, cyber security, venue management, and more. NCompass has partnered with some of these universities to develop its Game On internship program. Julie: If there is nothing in your local community or school, then reach out online. The beauty of gaming and esports is that you have a global reach right from your home. Find a guild, clan, or a team that you can play with. You never know—you may meet someone who works at that publisher. If there is an event you that you went to or researched, find out who produced the event. See if they are offering jobs or internships. Colleen: I didn’t think I would find myself in gaming, but when opportunities came up at my last job I took them. Don’t feel stuck in the job you’re at. Always be on the lookout for something new and more in line with your skills and passions. Know your worth, and don’t be afraid to be confident in the skills you’ve developed, because odds are you’re pretty well aware of what you can handle—don’t downplay your strengths. Donna, Kae: Embrace fear. Some of the best opportunities are unknown. Follow opportunities even if it means making a geographical move. Abby: Wherever you want to be in the gaming industry, just start. Gain experience, network and strengthen fellow women in the space. Whenever you feel that impostor syndrome creeping up know that you aren’t alone—reach out. We’ve all been there. Tricia: Have a clear goal. I always wanted to create something with the capacity to make others happy, something that could really make a difference and help people, empower them. With that goal in mind, I started to build out the skills necessary to make that vision come true. I worked in many different positions including sales, partnerships, business development, and created my own personal brand. Eventually, I caught the eyes of other people who had the same vision as I did. Donna, Kae: Go above and beyond with current job responsibilities. After you’ve completed 100% of your job responsibilities look for ways to take it to 120%. Lisa: Don’t let anyone else define what success means or looks like for you. Find your passion and strive to live that passion. Life is a quest, filled with challenges, choices, dead ends, and extraordinary discoveries, so go with your instincts and follow your own path. Be good to yourself and make sure to take care of the folks you meet along the way. And try to avoid cliches and extended metaphors. Donna, Kae: Take your interest into a volunteer capacity to help others. Volunteer with a charity organization within the gaming world such as Gamers Outreach, Women in Games, and others. To stay up-to-date on all our events and announcements, follow us on Facebook, Twitter, and Instagram! Join our community Discord here.